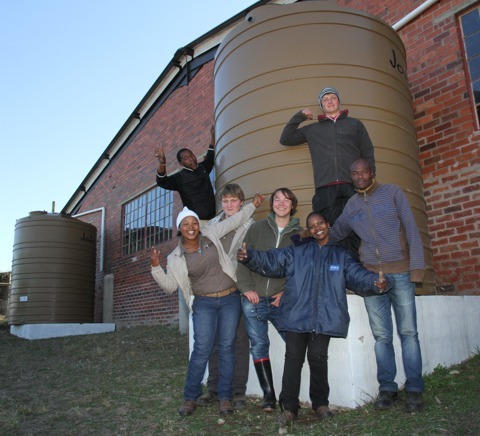 At the end of June, Fred and Karen Peters of the Manderston area organized two 10 000l water tanks to be delivered to the Sanctuary. Staff and volunteers (seen here left to right, Lu Belinda,Josh, Kees, Nonku, Ben and Wiseman) unloaded the bulky barrels on the happy day. As farmers, Fred and Karen understand the costs of maintaining a property contentiously and thus offered assistance to catch the substantial amount of rain water coming of the main building roof to then supply the daily Sanctuary needs. Monthly Sanctuary overhead costs will be reduced and we will be ‘greener’ in our resource management approach. Now all that is needed is the Spring rains!